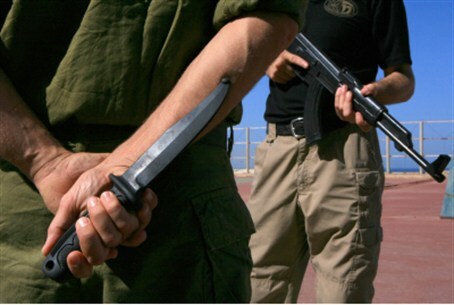 Security forces apprehend a Palestinian Arab terrorist who tried to stab a soldier near the town of Beit El. Security forces on Tuesday evening apprehended a Palestinian Arab terrorist who tried to stab a soldier at an IDF base near the town of Beit El in the Binyamin region. According to the IDF, the terrorist was caught as he was moving towards the entrance of the base while holding a knife, a PLO flag and shouting “Allahu Akbar”. The soldier was not harmed. The terrorist has been taken for questioning. The stabbing attempt comes hours after an Arab terrorist opened fire towards Border Police soldiers who were stationed at the Tapuah Junction in Samaria, near the city of Ariel. The soldiers returned fire and killed the terrorist. One soldier was lightly wounded in the incident and was treated at the scene by army medics. That incident came three days after security forces apprehended an Arab terrorist wearing a bomb belt at the same location. On Tuesday morning, dozens of Arab terrorists threw rocks at Israeli cars and burned tires on the road by the Arab town of Hawara, nearthe Tapuah Junction. Two Israeli citizens were lightly injured and two vehicles were damaged. In protest of the increase in terror attacks in Judea and Samaria, roughly 200 residents of Samaria demonstrated on Tuesday afternoon at the Har Bracha Junction, located just south of Shechem (Nablus).